If you’re a daring adventure traveler, Mount Kilauea in Hawaii is worth a hike to see it’s awesome power up close and personal. 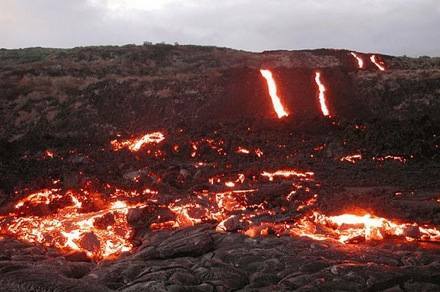 “Spewing” or “much spreading” is what Kilauea means in English. 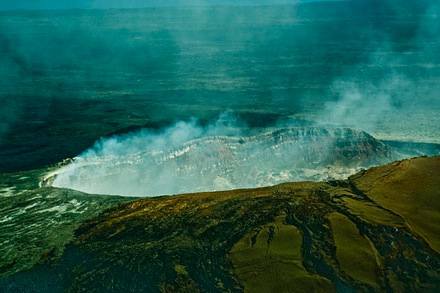 For 16 years Mount Kilauea in Hawaii has been one of the most active volcanos in the world, erupting 61 times. 34 eruptions were reported since 1952, and from 1983 onwards activity has been centered along the eastern rift zone. Nestled among volcanoes Mauna Kea and Kohala, ancient storytelling traditions alluded to eruptions as the displeased Hawaiian goddess Pele, frothed with anger at her worshippers. European missionary Reverend William Ellis was the first to identify its power in 1823. Over the past 20 years, Kilauea has been the instigator of many deaths attributed to volcanic gas exposure. The most famous incident was in 1993, when a tourist standing on cooling lava fell into the ocean as the thin layers of lava crumbled beneath him. Today, Kilauea and its mountain that bears the name is a major tourist draw where you can visit Kilauea’s lighthouse and Kilauea’s Point. Known as “guava” land, you can sample guava jelly or guava juice, among other tropical fruit concoctions. Other charms include beaches of silky sand and aquamarine waters inviting to snorkelers, surfers, divers or kayak enthusiasts. For those hankering for an off the beaten experience, ditch the snorkeling for a walk over an active volcano. It won’t disappoint. Wear sturdy hiking boots. Do not wear open toed shoes! That’s just asking for trouble. Do put on comfortable socks. Preferably ones made from Merino wool – a breathable material. Bring sunscreen and a hat with ample coverage. 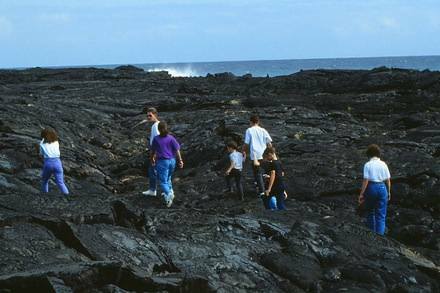 Long pants are recommended to guard against active lava spots or the sharp edges of dried lava. Be sure to pack a windbreaker or fleece, as it gets windy. If you have the chance, try lava watching at night. Pack a reliable, sturdy flashlight. Don’t forget water. Any hike is physical exertion and hydrating is important. Bring a video camera over a still camera. Both will do the trick, but capturing the live moment is even better. Be aware of lava and weather conditions. Check for lava updates or call +1 (808) 985-6000. Lava flow can change daily. A walking stick is useful to avoid falls or keep stable. To get there: rent or hire a car to Kilauea Visitor Center. Follow Crater Rim Drive to the Chain of Craters Road Intersection. After driving about 20 miles/32 km a turn-around should appear at the end of Chain of Craters Road. Park along the side, off the road. Sometimes the best viewing is at night when lava slides down the mountainside, giving off a red glow. 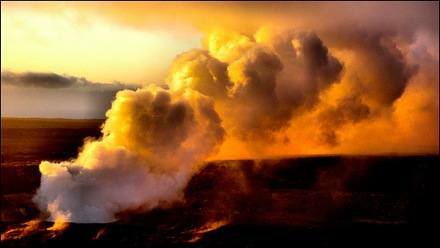 Or stand in silence to witness a cloud of steam when lava flows down to the water. Either way, you will notice lava entering the water or gurgling happily on the land. Don’t fret about time as park rangers are stationed at the end of Chain of Craters Road from morning to evening. There you have it, all you need to know to hike Mount Kilauea. It’s truly a unique experience that you shouldn’t miss. Tell us in the comments. Would you be brave enough to hike one of the most active volcanoes in the world? Join thousands of readers and get great travel advice. Subscribe to the Tripbase Blog via RSS or via e-mail. I’ve been to Kilauea and remember how crazy it was to be able to walk around these lava puddles without any supervision or ropes or anything. Always has to watch out where you’re stepping because during the day it’s hard to tell the difference between frozen, solid lava or I’ll-burn-your-feet still liquid hot lava. We love hiking volcanoes, so this has to be added to our bucket list! Thanks for sharing. 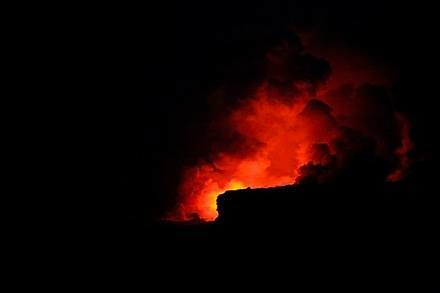 I’ve been there and went to see the lava flow at night. Quite astounded me that there were no guardrails or ropes set up to define the safe walking areas. The sky was pitch black and so was the lava ground cover, so even with a flashlight it was almost impossible to know what was ahead of me. I ventured out a way and had a great view of the moving lava, but there were folks that were getting way too close for my comfort! Really a spectacle to behold. Wow this looks like a fantastic experience! Every respect to Barbara too for making the trip at night. It must have been amazing.